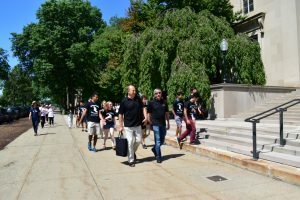 A joint venture between MIT Lincoln Laboratory and the MIT School of Engineering, Beaver Works Summer Institute is holding their second annual program for talented high school seniors interested in pursuing STEM careers. This year’s program runs from July 9 – August 6, 2017. With a larger class than last year’s 46 students, the Summer Institute has added two new courses in Autonomous Air Vehicle Racing and Cognitive Assistants. The hope is for high schools to implement some of these courses for their students, to spark what Beaver Works hopes will be a national and international expansion of engineering education. This past Friday, July 21, this year’s Summer Institute students braved the heat for their group photo. However most of them were more interested in the drone flying above them, which came as no surprise- this is MIT after all. After the photo op, students heard from the Director of MIT Lincoln Lab, Dr. Eric Evans. Already keen to find a job or internship at Lincoln Lab after their college graduation, the students were even more impressed after hearing Dr. Evans speak about the many innovative projects happening at Lincoln Lab, many which are classified, adding to the student’s curiosity. The most exciting part of the Summer Institute will happen over the August 5-6 weekend: the RACECAR final! From January to May, students complete an online course that gives them a rich background on the concepts they will need to build their own autonomous RACECAR while they are at MIT. Each day of the Summer Institute, students will participate in hands-on activities and hear from MIT experts and researchers to build an understanding of autonomous systems development, including controls, flight dynamics, navigation, and computer vision. By the fourth week, students have learned the skills necessary to race their autonomous RACECAR, reaching speeds of up to 40 MPH. It would not come as a surprise if many of these students found themselves back at Lincoln Lab in 5 or 6 years time, working on the exciting projects they have been exposed to during their time at MIT this summer.